Tickling the Ivories – OMG Afterschool Enrichment | Oksana Management Group, Inc.
Every kid benefits from music education and the opportunity to learn the fundamentals of piano might be just the thing. 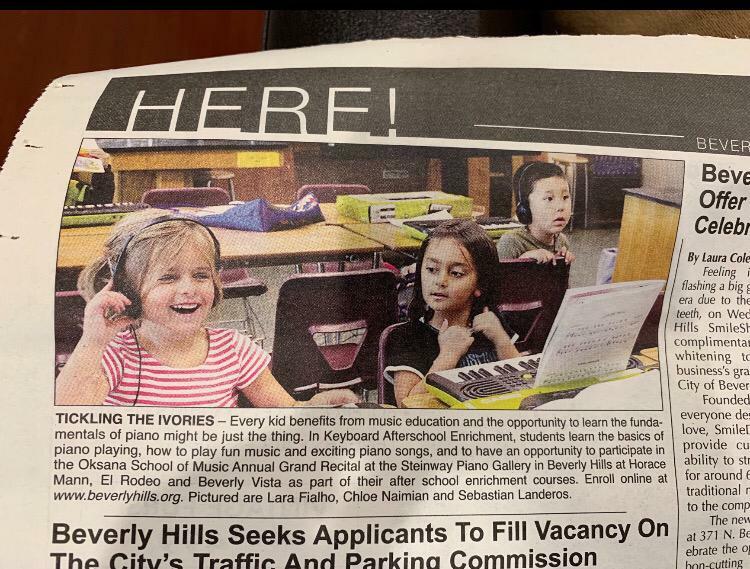 In Keyboard Afterschool Enrichment, students learn the basics of piano playing, how to play fun music and exciting piano songs, and to have an opportunity to participate in the Oksana School of Music Annual Grand Recital ath the Steinway Piano Gallery in Beverly Hills at Horace Mann, El Rodeo and Beverly Vista as part of their school enrichment courses. Enroll onlina at www.beverlyhills.org. Pictured are Lara Fialho, Chloe Naiman and Sebastian Landeros.